“What is relevant in the book and gives vivacity to the narration is the style of the expression, with a flowing narration, from which characters and events take shape with a great realism. The style is swift and effective, and the characters stand out as if they were alive, evoked by an extraordinary emotional charge. The principle inspiring this work may echo after Paul Ricoeur who, in Time and Narrative, states: «Life is a tale, not a theorem». Readers can emotionally relate to this novel because the facts narrated are naturally occurring events, seen and depicted with a child’s perspective, a child who, as an adult, remembers those events with the same emotions felt in youth. The most important merit of Luciano de Angelis’ book lies specifically in this similarity between time and memory, in a narration that is both linear and graphic”. Ermanno Circeo, Italian Literature Professor and literary critic. 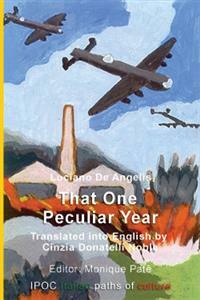 Front cover: Luciano De Angelis: “And, just like in my own drawings, the explosions of the bombs were red on the bottom and black in the middle, with a fine gray cloud above them”. That One Peculiar Year is one of those delightful books that, little by little, take children in a to-be-discovered world, and allow them to participate in unforgettable adventures. At the same time, this book is also engaging and very enjoyable for those who left childhood some time ago. Even without the author’s clear statement, we would still receive the impression that as a child he had immersed himself in a timeless world, like the one of Tom Sawyer or the boys in Paal Street, where he created an environment of his own within the places, the circumstances, and the people around him. That year was indeed remarkable: from September 14, 1943, to the fall of 1944, unthinkable events happened in the Abruzzo (Italy) region. In the protagonist’s boyish eyes, the very first sign of the times is the pillage of an abandoned military train in the Pescara station. Then other trials follow: bombings on the city; an adventurous escape toward the mountains surrounding L’Aquila to find refuge among almost unknown relatives; occupations first by Germans and then by Allied forces; and finally, the return to the city and the slow return to normal life. The boy wanted to live exciting adventures, striving at the same time to keep his father’s counsel, a father who had to live away from his family so as not to lose his job. The father entreats his son to always do what must be done, no matter what happens: thus the “Death Brothers” secret society is born (with only two members). The author, a well-known medical doctor who has long cultivated his passion and talent for painting, dedicates this book to his grandchild. For him and those unfamiliar with the great events of those times, the author inserts brief and precise historical notes about the events taking place in Abruzzo and else-where. This subtle yet indispensable historical framework describes events that influenced the young protagonist’s life and the lives of those around him. The book is a series of vignettes that naturally follow each other, forming a precise design. People and objects stand out clearly, such as the author’s relatives and family friends, and even the Germans in the veterinary ward, who are «all good people, after all». With just a few strokes of the pen, one cousin’s character comes out clearly with his sheep, a rigamarole, and a juggling dog - all unforgettable images of a world now lost. Humor is the leaven of the book: children stay interested while adults come to understand the specific aspects and contradictions of those times. Along this line, we need only to remember the story of the uncle «with heavy hands», who is taken to prison twice, first as an antifascist, then as a fascist, and who is in turn beaten by both parties. This is one of the many events of a more innocent time, when, away from doctors and modern medicines (as the author mentions, he being one who understands this), people didn’t live as long as today but were nonetheless more content with life. Perhaps it’s not a mistake to think that the book is an invitation to join the Death Brothers, who never give up and always put their motto into practice: «Do what you must, no matter what happens». Italian Literature Professor and literary critic. The sky was as dark as lead and the road muddy, a heavy rain having fallen the night before. The pungent smell of something burning reached us as we walked briskly towards Scoppito. We talked about the latest happenings. At the end of September, the news of nine students executed by the Germans in the Casermette  haunted everyone, especially us boys, who thought of those young men as true martyrs worthy of emulation: they had organized an unsuccessful armed resistance against the foreigners. Suddenly, at the turn of the road by the cemetery, a German truck appeared to our view. It hung halfway over the curb, leaning on its right side. Flames had changed it into a black, still-warm skeleton. Grey smoke rose from it in slow rings and shriveled into the humid air. From a puddle next to the truck, Aldo picked up a bayonet, its blade surprisingly shiny and intact despite a burned handle. We looked into each other’s eyes. «This is a sign», I said. «The moment has arrived for us too». «We’ll be the Death Brothers», Aldo added in a whisper. The news had spread. At the central station, a train filled with all kinds of goods had been parked and abandoned. It was probably a military supply convoy that, after the armistice and the disintegration of the Italian army, had been left without guards or destination. Dad came running home with the news. «They are pillaging it», he exclaimed. «I’ll go see what’s happening». «We are coming too!» Vittoriano and I shouted in unison. «You are too little», I lectured my six-year-old brother, from the height of my eleven years. «And he has to take a bath» concluded my mother. The train was extremely long and swarming with people. From huge, thrown-open doors, the freight cars exhibited the most incredible contents: mountains of salt assailed by men armed with shovels; sacks and sacks of flour; packages of sugar; wine barrels; jars of oil. Then liquors, cases with “Serraglio” cigarettes, cans of paint, chairs, and tables. Like an army of ants attacking an enormous dead caterpillar, the crowd - a kind of frenzied and desperate humanity - was rioting and emptying the cars. Everyone managed the best he could. Some worked in teams, and some, all by themselves, grabbed what happened by. Just beside me, a man grabbed a huge sack of flour, emptied half of it on the ground, and then loaded it on his shoulders. We could not see a railroad worker or soldier in any direction. «Let’s go home», Papa said. Pescara looked like the Land of Abundance. Leftovers from the hoard of pillagers were scattered all along Corso Vittorio Emanuele. I picked up a package of herb tea; Papa took a box of Modiano playing cards. «So we also take something home», I concluded. 2 One of Pescara’s main avenues. «To the table! It’s ready!» Mama called from the kitchen. I was fascinated looking out the bathroom window at the railroad, three hundred meters from our home, and the uncultivated fields in between. Suddenly, first one, then two, and finally three airplanes appeared in front of my eyes, right above the chimney of the Ocean Blue Paint factory. Flying low, they resembled the American Flying Fortresses, or Liberators, that I used to draw and color, inspired by Beltrame’s and Pisani’s war illustrations in the “Sunday’s Newspaper” and the “Illustrated Tribune”. And, just like in my own drawings, the explosions of the bombs were red on the bottom and black in the middle, with a fine gray cloud above them. Strangely, the sound, like a bang, reached me later. I still remember the time, which to me seemed immensely long, between the sight and the roar. Then, as in a dream, between the noise of windows breaking and of the house shaking, my mother’s hysterical scream rose high. Without uttering a word, Papa dragged us headlong down the stairs and then outside. The courtyard was crowded with neighbors, and the last pillagers were already rushing over from the bombed station, looking for safety. Faithful to the teachings of the Balilla  Musketeer course, I lay on the ground, my face downward and my arms, legs, and mouth open wide. Under my chest I felt the ground quaking with each explosion. Among others’ cries was my mother’s sharp scream; my father could barely keep her on the ground. «Mama, don’t scream», Vittoriano suddenly lamented. «Otherwise they’ll hear and shoot us». «Sylvia, Sylvia, protect these children; save them!». 3 Namely, La Domenica del Corriere, a popular newspaper, and La Tribuna Illustrata, a popular magazine. 4 During the Fascist regime, all Italian children were enrolled in the Balilla program, where they were indoctrinated and trained as future soldiers for the regime. 5 Austrians call the Italian region Trentino Alto Adige, South Tyrol. The population there speaks both German and Italian fluently. Most of the inhabitants are of Austrian descent. Mama didn’t want to go home again. Papa forced her to, since she was still wearing her nightgown. Suddenly she calmed down, and I saw determination in both of my parents. We needed to leave Pescara as soon as possible. Papa set out to pick up Grandma Gilda, who lived on Viale dei Pini. We stayed home and packed. But how could we carry our suitcases to the Porta Nuova train station,  which had been spared by the bombs, and from where, it was rumored, a train would soon leave for Sulmona? Mama decided to go with Vittoriano and me to search for a handcart at the electric company offices where Papa worked, the Unione Esercizi Elettrici. There, in the deserted courtyard of the UNES,  we found it: a cart with long shafts and no sides. Pushing the cart, we covered the kilometer between the plant and our home in a surrealistic state. The city looked deserted, but now and then someone would cross our path or run by us. Once we were at home, we loaded our luggage and anxiously waited. After a while we saw Papa’s and Grandma’s unmistakable outlines. They were coming and pushing a road-sweeper’s cart loaded with suitcases. I now wonder where they found it!